"Is that what it is? They dare to tamper with the forces of creation?" "Yes. And we must dare to stop them!" 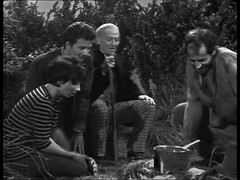 This is the Fiftieth broadcast Doctor Who episode and was shown a year (OK 52 weeks) after The Dead Planet gave the world it's fist glimpse of the Daleks so is the closest episode to the Daleks first birthday. Our episode title relevance meter wonders who or what the Waking Ally was? I haven't got a clue! The episode rolls along nicely but there's just a few things about it that bother me. There are a rather large number of coincidences involved. Have travelled down for nearly 20 minutes who's the first person Ian & Larry run into? 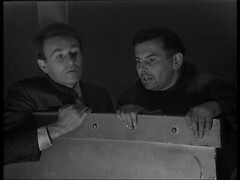 Wells, who they left at the top of the shaft at the end of the last episode. Then they run into a Roboman who just happens to be Phil the converted brother of Larry. And *THEN* the captured Barbara & Jenny get assigned to Wells' work party! LARRY: My brother Phil's working at the mine, and he said if we can find out what the Daleks are up to, we might be able to beat them. IAN: Makes sense, doesn't it. LARRY: His theory is that the Daleks want the magnetic core of Earth. IAN: I don't know how you're going to find your brother here, Larry. LARRY: I'll have a darned good try. IAN: Even if you do find him, what are you going to do for him? LARRY: Get him away. He's obsessed with whatever it is the Daleks are doing. Look! IAN: Don’t worry. We’ll stay here for a while. You know, Larry, this mine doesn’t make sense to me. Where’s all the modern machinery? LARRY: The Daleks brought machinery from all over the world. All they seem to be shifting is rocks. IAN: Yes. I suppose they could be processing it somewhere. LARRY: Who knows what the Daleks are up to? I told you what my brother Phil said, all they want is the magnetic core of Earth. DAVID: Now that you’ve seen the Dalek base, what do you think? DOCTOR: Well it’s quite obvious to me its the centre of their operations. DOCTOR: Yes, quite. You know, you surprise me, Tyler. Why didn’t you concentrate your efforts here? TYLER: We’ve been fighting the Daleks everywhere. Well, the fact that they started mining operations didn’t seem all that important. DOCTOR: No, I think perhaps it might be the answer to the question as to why the Daleks are here. DAVID: But why, Doctor? Surely they’ve invaded us? DOCTOR: Oh no, it goes much deeper than that. You see, man, to them, is just a work machine. An insignificant specimen that is not worth invading. Absolutely useless. It doesn’t matter to them whether you live or die. TYLER: Yeah, that’s true enough. DAVID: Well, what are they digging for? DOCTOR: Well, at the moment, my boy, I’m not quite sure, but let us say something that this planet contains. Something that no planet has. TYLER: And you think if it was something on the surface, they’d have just collected it and gone? DOCTOR: Yes, quite, quite. Instead, there they are, burrowing like moles down and through the crust of the Earth. TYLER: But isn’t that impossible? I mean, without causing an eruption, a huge earthquake no one could survive. DOCTOR: Not unless they know how to control the flow of living energy, hmm? DAVID: Is that what it is? They dare to tamper with the forces of creation? DOCTOR: Yes, they dare. And we have got to dare to stop them. DALEK SUPREME: Give me your report. DALEK: The main drills have penetrated the quartz strata. We are within four miles of the Earth’s outer core. DALEK SUPREME: When will the final breakthrough occur? 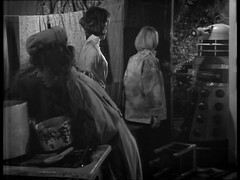 DALEK: The slave parties are clearing the top of the fissure now. DALEK SUPREME: What remains to be done? DALEK: Only to put into position the penetration explosive. The charge is in the fissure capsule now. When positioned, the charge will strike the fissure in the Earth’s crust here. DALEK SUPREME: The fissure will expand, the molten core be released. 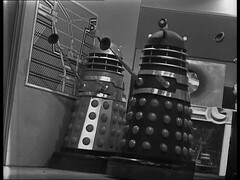 DALEK: We will then control the flow until all the gravitational and magnetic forces in the Earth’s core are eliminated. DALEK SUPREME: Excellent. I will now announce to the Dalek Earth force, completion of Project Degravitate in two hours time. The science here is dreadful! I'm not sure if it was known at the time if other planets have a magnetic core but even so it's a big leap to assume Earth is the only one. I wouldn't have thought that Bedfordshire was the best place to drill through Earth's crust, I thought the UK was on a pretty thick & stable part of the crust and that there were much thinner points. 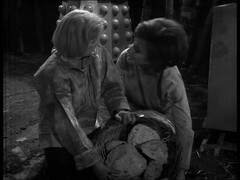 Yet the Daleks are drilling here and we get another project drilling into the Earth in Inferno. DALEK: Attention all units. Stand by for an announcement by the Supreme Controller. DALEK SUPREME: This is the Supreme Controller. Our mission to Earth is nearly completed. We were sent here to remove the core of this planet. Once the core is removed, we can replace it with a power system that will enable us to pilot the planet anywhere in the universe. WHAT ????? They want to turn the Earth into a giant spaceship ???? And yet, somehow, this mad plot point is actually picked up many years later in The Stolen Earth/Journey's End! 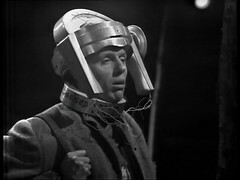 In between the Time Lords move the Earth in Trial of a Timelord and the Cybermen take Earth's twin Mondas for a wander round the galaxy by installing a propulsion system! There seems to be some confusion as to what the Dalek's leader is called here. 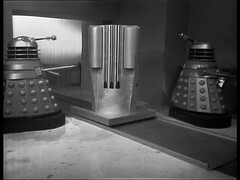 DALEK: The Black Dalek will see you, but if you are lying, you will be killed. Follow me. Yet above another Dalek refers to him as Supreme Controller. I'm using the term Dalek Supreme throughout. 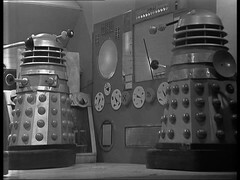 Another oddity here is that one of the standard Daleks in the control room is sporting a black eye ball as opposed to the silver ones the rest of the regular troops have! Dalek 6388 think this is the other prop returned from Barnados and it's been like that all along but this is the first time I've spotted it. Playing Ian's companion Larry Madison is Graham Rigby but I'm not sure who plays his brother Phil. He should be credited, as he gets a line of dialogue, but isn't. I'm presuming it's one of the credited Robomen for this episode, Peter Badger or Martyn Huntley, who both appear in all six episodes of the story. Huntley has already been in Doctor Who in The Sensorites: A Desperate Venture as the First Human and will return as Warren Earp in The Gunfighters episodes Johnny Ringo & The O.K. Corral. Playing the women who capture Barbara and Jenny are Jean Conroy & Meriel Horson. 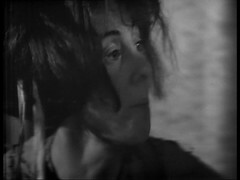 They take up a sizeable portion of the first half of the episode and are another example of humans collaborating with the the Daleks. SUSAN: Just in time for food. DOCTOR: Ah, yes, my dear. DAVID: Ah, we were just, er, well, I was just, er. DOCTOR: Quite, quite. I can see something’s cooking. I think The Doctor may be a little bit more observant than he lets on and has spotted the budding romance, hence the actions he takes next episode. As well as being the first Earth Invasion this story gives us the first glimpse of an Earth in the future. OK apart from the calendar in the first episode there's little to date this serial any later than the date it's filmed. All the characters look like they're dressed straight out the sixties. We've already met future humans in space in The Sensorites and we'll meet them again in the Rescue (next up), the Chase and Mission to the Unknown before seeing the Earth of the year 4000 in The Dalek Masterplan. The Earth's destruction is seen in the year 10 million in the Ark. 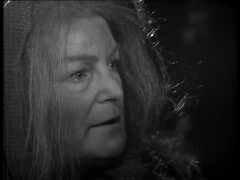 The Tenth Planet offers an Earth of 1986, at the time a futuristic setting but one the series would eventually overtake, but Troughton visits the near future Earth several time plus a visit to a far future Ice Age. Pertwee's visits without the aid of the Tardis in Day of the Daleks and again with the Tardis during Frontier in Space, but Tom, surprisingly, only turns up once in the Sontaran Experiment. Davison visits in Earthshock & Warriors of the Deep, Colin during Trial of a Timelord and Sylvester McCoy in Paradise Towers and the near future (and quickly overtaken) Battlefield. Coupling these visits with encounters with humanity all over the Universe presents some problems resolving a future history for humanity. However in several of these stories The Dalek Invasion of Earth remains a crucial event. 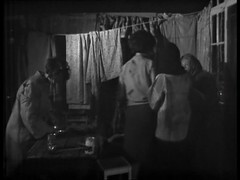 This episode survives as a 35mm film negative which was used to make the print from which this episode was transmitted. Why the episode was transmitted from film isn't 100% clear. > but I'm not sure who plays his brother Phil. > He should be credited, as he gets a line of dialogue, but isn't. > who both appear in all six episodes of the story.